Hi, hello, how are you all? I know I have disappeared from the blogosphere for some time. As I told in the previous post, my sister and her family are with us for the summer break. So naturally I became little busy chitchatting and visiting different places. Actually I didn’t want to take a break, but time just flew by. Finally I am back with an interesting recipe Srivalli has chosen for “Indian Cooking Challenge” event. I prepared these for my little one’s 5th b’day party last Saturday. Everyone liked it so much. Thanks for the yummy recipe Srivalli!! Heat 2 tsp of ghee in a kadai. Once the ghee is hot enough, simmer the flame and roast cashew nuts and raisins. Once the raisins balloon up, remove. Then roast the grated coconut. Remove once done and Keep all these aside. Add the remaining ghee and roast the Rava till it’s well roasted and aroma starts coming out. In a bowl, take all the roasted Rava, Nuts, and Coconut and add the Cardamom powder. Then add the sugar. Mix well. My usual way of making Rava Laddus is slightly different than the method given by Srivalli. I first roast cashews, raisins and cardamom in hot ghee and keep aside. Then add rava and sugar and stir for some time and finally add little milk till the mixture comes together. I don't add coconut powder. Then mix cashews, raisins and cardamom with rava mixture and turn off the flame. I take small portions of rava mixture and roll into balls when rava is still warm as it tends to get hardened if delayed. Tip: To handle warm rava mixture without burning your hand, take some cold milk in a plate, dip your hand/palm in it and then roll the ball. You won’t feel hotness of the rava mixture. My MIL makes rava ladoo nicely..she ground rava usually..this is also looking good:)will try once!! Wow... you made sooo many ladoos. Glad you all enjoyed it. wow..they look so delicious..you managed to make so many.. Wonderful laddoos. Happy belated birthday to your little one and hope you enjoyed your sister's visit. Wow so many tempting ladoos. Yummy. Looking at so many ladoo today..mouth watering. Yummy laddus. It is the 3rd post with rava laddu. Today it is showering laddus. Now I want to make some:). Those laddus are tempting me Uma..looks like I need a bowl to catch all the drool. yuuummmmmy ladoos today, urs look perfect dear..!!! 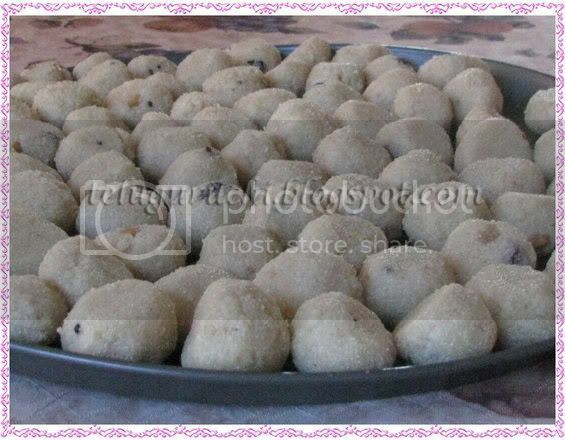 Rawa Ladoo is a easy Diwali sweet at our home. Looks delicious. Hope you had a great time with your sister. Oh my you made so many!! i finished mine yesterday only, feel like grabbing one from here :) glad everyone enjoyed these! lovley laddus, i love this laddu. can i have some. yours looks so tempting. Uma, good to see you again, dear, and that too with one of my favorites, rava laddoo. I could polish off that whole plate! Hey, it's good to take a break and have fun with family and friends! I love rava laddoos. Yum!! wish I could have one now! !